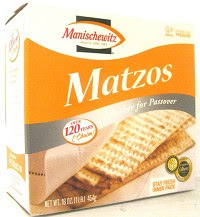 Home › ModernTribe's Blog: Modern Jewish Life & Style › Manischewitz, Streits, Yehuda, or Other: Which Matzo is For You? Manischewitz, Streits, Yehuda, or Other: Which Matzo is For You? Those of you who follow me on Twitter or Facebook may have seen my matzah poll: Which matzah is your favorite: Manischewitz, Streits, Yehuda, or Other? Thank you everyone for your input. It was so fun to hear your opinions! Streits was the clear "friends" choice! 10 people gave their opinions: 5 votes for Streits, 3 for Yehuda, 1 for Manischewitz grape flavored and 1 vote from my sweet sister-in-law Pam for, "goat cheese with garlic and herbs on any matzah you serve." Streits seemed to have a lot of nostalgic weight and, as mentioned by Josh & Lauren, is the one "for the unleavened experience of a lifetime....."
But in our empirical taste-test: Yehuda was the winner by consensus. Among friends, I have a reputation for whipping up a semi-scientific study every now and then. For our second seder I held a taste-test as an interlude between dinner and dessert. I placed slices of each brand of matzah on separate plates, marking the bottom of the plate and the matzah box with matching stickers so that the samples could be identified. I mixed up the plates so that I wouldn't know the brand of each matzo (making it double blind). Four of us privately tasted the three matzos and chose our pick... all four of use chose Yehuda! 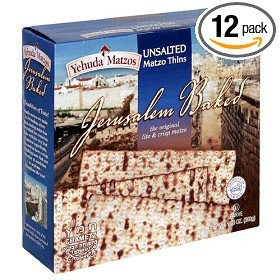 Now, even though all matzah boxes were bought at the same time (semi-controlling for freshness), a possible confound could be that we happened to get a bad box of matzah. Only one box of each brand was sampled and the one box could, possibly, not have been representative of the brand. However among our samples, all of us preferred Yehudah matzah over the Streits & Manischewitz sampled. Manischewitz new packaging is awful. Not recognizeable and looks generic. I could track stuff easily — now I have to study the package.